In medium bowl add all berries, granulated sugar and liqueur (if using), gently combine, set in refrigerator for 20 minutes. In another bowl add mascarpone cheese, powdered sugar, cream and vanilla, mix together with hand mixer on high until mixture is thick. Lay crepe out, spread about a 1/3 cup of cheese mixture down the center of the crepe, top with 1/2 cup of the berry mixture, fold sides in towards center, sprinkle powdered sugar on top. 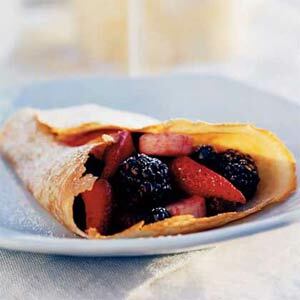 You can add less berries to the crepe and keep some to garnish on top if you wish. This dessert is so easy, you can keep berries and cheese mixture in the fridge until your ready to make and serve…Enjoy!!! !